This year I had a little bit of pie crust dough left over. Every time this happens, I always make pie crust roll-up thingies. My mom used to make them. Basically you roll the dough out into a rectangle then scatter little pieces of butter all over it. 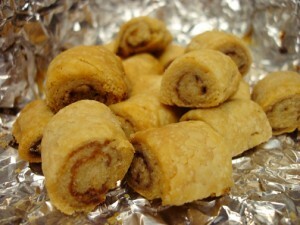 Next you sprinkle sugar and cinnamon over the entire thing, then roll up the dough, starting at the long end so it sort of looks like a jelly roll. Then you cut them into about 1″ long pieces, place them on a cookie sheet and bake until they are golden and flaky. Roll the dough out in the shape of a large rectangle. I eyeball the sugar and cinnamon. I sprinkle sugar all over the crust but leave a bit of space from the edge to make rolling easier. Then sprinkle cinnamon over the sugar (use the amount of cinnamon you prefer. I probably use about a tablespoon or so.) Dot tiny bits of butter all over the crust last. This makes it all carmelize. I usually cut the crust down the middle length-wise otherwise the roll will be super large. Then I roll from the outside toward the cut center portion of the crust so it has a clean seam. Once you have rolled up each half of the crust, lay the roll with the seam side down and cut into smaller pieces. I usually make them about an inch wide. Then lay them seam side down on a cookie sheet (I line with foil to make cleanup easier) and bake at 350º until the crust is golden and flaky looking on the outside. I hope this works for you! Please let me know how it goes if you give it a try! Thanks!